Poland’s Rak 120mm self propelled mortar is the sort of turreted system that Russia has had for years but never really caught on in the west. 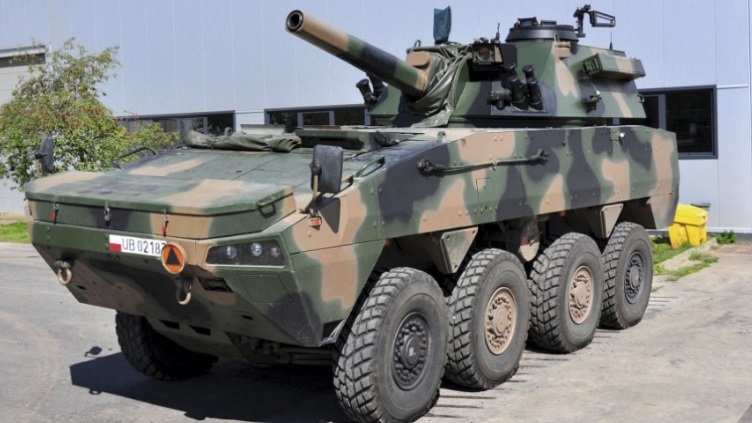 It’s built on the Rosomak chassis, which is a Polish-made variant of Patria’s 8×8 AMV. In the turret is a 120mm breach-loading mortar. It has an automatic loading system with a capacity for 20 ready rounds. 26 additional rounds are stowed in the hull. The autoloader and mortar has a rate of fire of 6-8 rounds per minute. The mortar has the expected computerized fire control system that is integrated with the GPS/INS navigation system. This fire control system also allows for direct fire with a laser rangefinder and a day/night sight. A coaxial 7.62mm UKM-2000D machine gun is also provided. Chief among the advantages of a turreted mortar carrier is the ability to provide protection for the crew. The Rak has STANAG Level 1 armor protection all-around, which means it’s rated to resist 7.62mm M80 rounds and 5.56mm M855 and M193 rounds fired from a distance of 30 meters. It’s also proof against fragments from a 155mm artillery shell detonated at 100 meters. That’s pretty good, but I’d prefer a bit more protection. More specifically, I’d be concerned about DPICM-type submunitions hitting the roof, and I don’t expect the Rak to be protected from these. The Rak has a crew of three, which is notably less than the simpler mortar carriers. That’s good for life-cycle costs. Overall, I like the Rak a lot. This entry was posted in All and tagged militariana, news on May 10, 2018 by parvusimperator. Given how avant-guard the poles were at the time, I’m surprised they didn’t choose the Amos. How will the munition supply chain be affected I wonder. These use a different type of 120mm. No supplies from the US in case of war for them. Amos is pretty expensive, though there is a one-barrel version. Poles might wanted to DIY because of those 120mm ammo stocks or because they wanted to develop native industry. Or maybe both.